2b. Oils/Fats used in S.M. 2c. Other R.M. used in S.M. Soap Noodles are the mainly raw material for the production of soap bars, by means of soap finishing lines. They are small cylinders of soap with a variable diameter from 8 to 10 mm and a length of about 20 mm or little bit more. The biggest soap noodles manufacturers are located in Malaysia and Indonesia, thanks to the big palm oil plantations cultivated in the Countries. Other big soap noodles industries are located in South American Countries, where the raw material used to produce soap noodles is animal fat, however in the last decade also in these countries the soap factories started to use vegetable soap noodles. Soap Noodles are mainly produced using full boiled saponification plant in case of oils and fats or neutralization plant if the raw materials are the fatty acids. In the last few years it is easy to find on the market SWING soap noodles that are cheaper then semi boiled soap noodles. Toilet soap noodles are extra-white, snow-white or off-white and have a TFM of 78%, while laundry soap noodles have a TFM of 72%. Some preservatives, like ETDA are necessary for the preservation of the soap noodles. 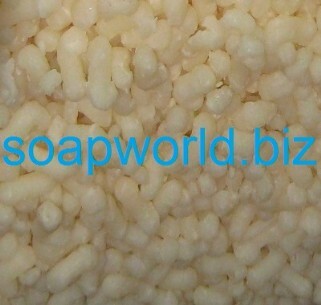 In developing countries, low quality soap noodles are used to produce all types of soaps. The colour of these noodles is yellowish up to brown (depending from the raw materials colours) and the TFM can decrease up to 50%. Some soap manufacturers sell filled soap noodles that are used for laundry soap and multipurpose soap manufacturing since these soap noodles already includes fillers. Laundry Soap Noodles are manufactured using cheaper grade palm oils with lower oil content than Toilet Soap Noodles. Fillers, like kaolin and sodium silicate, are added into Laundry Soap Noodles to give hardness the Laundry Soap Noodles. This is useful as when the Laundry Soap Noodles are used to produce Laundry Soap Bars that will be hardened and suitable for washing clothes and other purposes. On the Market is possible to find also Translucent Soap Noodles. Standard soaps noodles are not naturally translucent. The Translucency is achieved by forcing the soap molecules to line up in such a way as to permit the passage of light; this can be obtained using special/powerful soap finishing lines and with the addition of special additives like Glycerin, propylene glycol and Sorbitol, to increase the level of translucency. All the above soap noodles are natural products, but on the market is also possible to find synthetic soap base to produce synthetic soap bars. 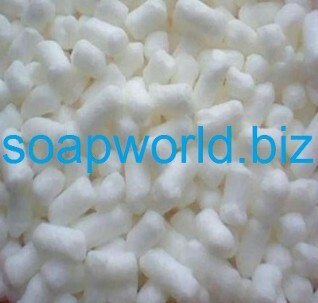 If synthetic soap base is mixed with natural soap noodles, the produced soap is called "combo soap". Soap noodles are usually sold in bags of 25 kilos or in big bags of 1 Ton. Toilet Soap Noodles are more expensive than Laundry soap noodles and Multipurpose soap noodles, because the quantity of oil (TFM) is higher. The price of soap noodles change every month, because it is directly linked to the palm oil price.